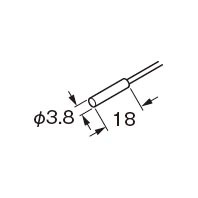 (Note):If the cable of the sensor head is cut or extended, the sensing range and the hysteresis change. Net weight 35 g approx. (Note) The weight of the threaded type includes the weight of two nuts and one toothed lock washer.